A memorial (…) consisting of a metal cube balanced on top of a rock. 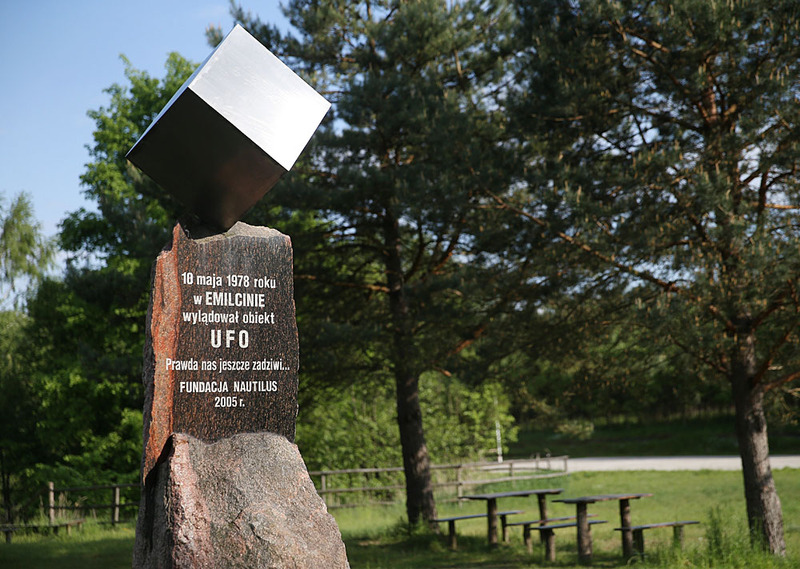 It commemorates the most famous alleged UFO abduction case in Polish history, that of Jan Wolski, which was said to have taken place on May 10, 1978. 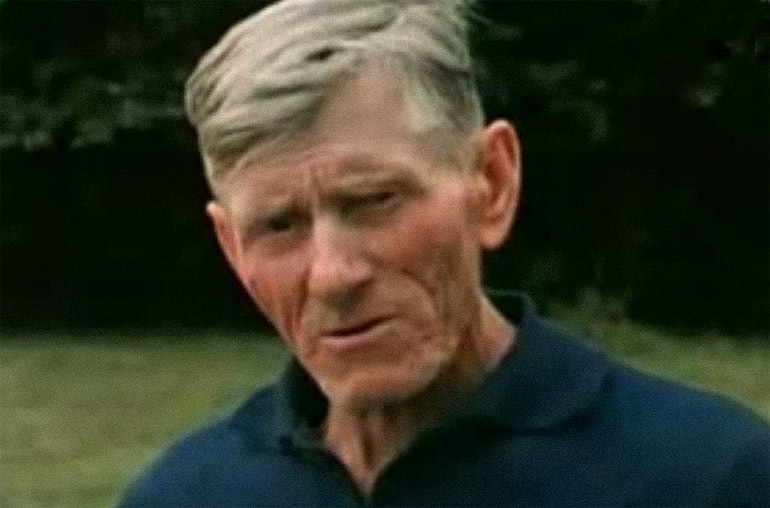 At the time of the so-called ‘Emilcin incident’, Wolski, a simple peasant, was 71 years old. This is how it all went down, according to an account he gave in the 1978 documentary film Odwiedziny, Czyli u Progu Tajemnicy (editor’s translation: A Visit, or on the Threshold of Mystery), made shortly after the UFO’s alleged appearance. The mysterious craft was as big as a medium-sized bus, entirely white and equipped with elements that whirled and buzzed. Fortunately, there was a lift leading to it. Wolski got in and as he rose up out of the lift, one of the beings waved its hand inviting him to step inside. Even though the strangers had green skin, finned fingers, and were wearing tight black overalls, Wolski accepted the invitation. The minimalist interior featured nothing but a few benches and bare walls. Inside, his new green-skinned companions convinced Wolski to get undressed and then proceeded to examine him using a pair of little plates. After he put his clothes back on, the strangers were kind enough to offer him a bite of a strange honey-like food but Wolski wasn’t hungry. On his way out he said ‘Goodbye!’ and nodded and the well-behaved beings nodded back. 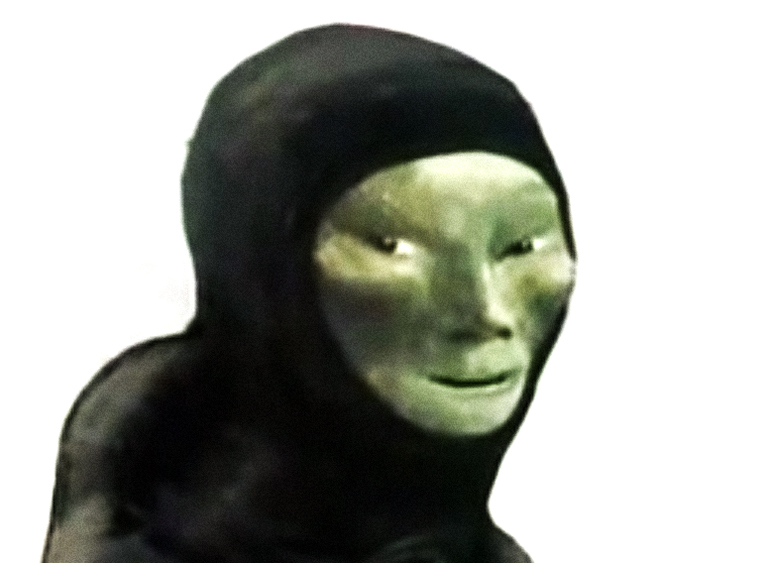 Despite its undeniable silliness, the story is possibly the most famous account of a Polish ‘close encounter of the fourth kind’ (yes, fourth, that’s how UFO experts dubbed it). 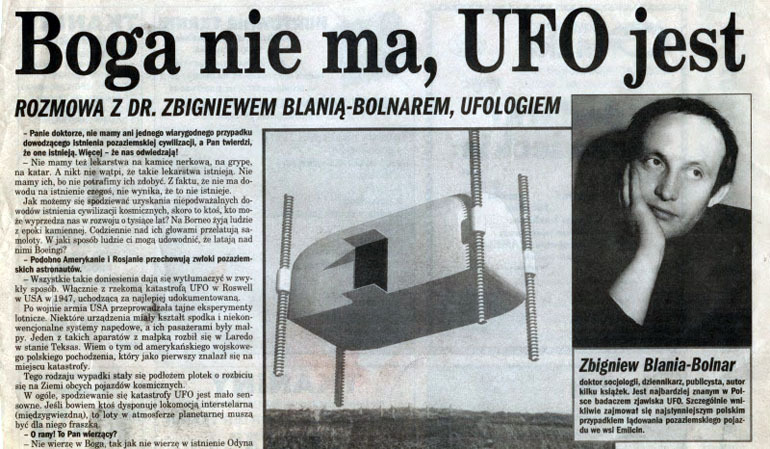 We owe this largely to Zdzisław Blania, a so-called ufologist from the city of Łódź who came to Emilcin shortly after 10th May to investigate the alleged incident – or more precisely, to propagate it for his own benefit. Up to that time, Blania, a well-read and intelligent man, had been publishing articles about UFOs in the Polish press, however nothing that caused a major sensation. When he learned about Wolski’s claims, he rushed to Emilcin and took serious efforts to present the story as credible. For example, he got a psychologist to confirm that Wolski was actually sane and that he wasn’t lying. Blania also managed to present another witness of the UFO’s appearance, a 6-year-old boy who said that he saw the bus-like craft flying over the village (today we know that the boy’s account had been manipulated by Blania). I don’t believe that the witness could’ve given the details of the appearance or demeanor of the beings using only his imagination. He describes, for example, how their suits looked even though this information never appeared in Polish publications on UFOs (…). So I believe this is an account of an absolutely real, authentic experience. Blania kept profiting from the story for years. As late as 1996, he published the book Zdarzenie w Emilcinie (editor’s translation: The Emilcin Incident) devoted to Wolski’s tale. The ufologist managed not only to personally gain from the Emilcin incident, but also considerably helped in transforming it into a nationwide affair (even an international one, as time has shown!). When I was maybe four or five, I read that comic in Relax magazine and it really made a big impression on me. Later I’d keep thinking about that story, especially on a trip to the Tatra Mountains with my grandfather. I remember I’d go up Mount Gubałówka on my own and run down to where we stayed, scared all the time that somewhere along the way, in the woods, I’d meet aliens looking just like the ones Wolski met. 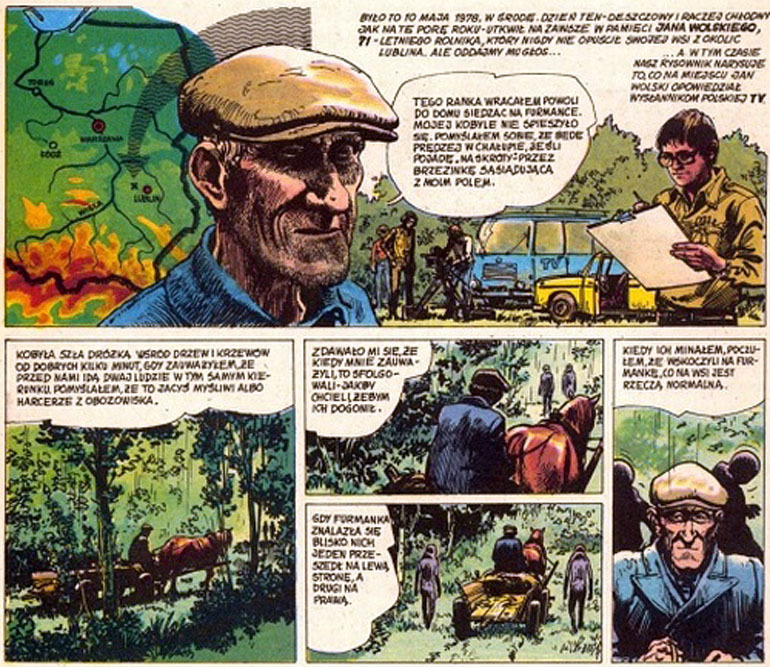 I think that the comic’s setting in the Polish countryside had a lot to do with that. What resonated with the young Łukasz probably also resonated with the rest of the public – having our own, ‘Polish’ aliens must have seemed quite exciting. Especially that Roswell was so far beyond the Iron Curtain that it almost seemed completely inaccessible, like a place… on another planet. Eventually, at the turn of the 1980s, the story of the Emilcin incident became more or less general knowledge. Interestingly, those grown-ups that chose to believe in aliens visiting Emilcin didn’t at all mind that the police had ruled out any extra-terrestrial activity in the area. Due to the commotion caused by Wolski’s revelations shortly after the purported event, law enforcement was called into the village to investigate and found no evidence whatsoever to back the quirky tale. The police concluded that Wolski probably dreamt the whole thing up in his sleep. Nevertheless, it’s hard to determine what’s the exact origin of Wolski’s fairy tale, especially that the main actors behind it all have already passed away: Wolski in 1991, Blania in 2003. Some say that Wolski was a storyteller and that he liked the attention that came with his UFO narrative. He would show people around the site where he allegedly saw the alien bus-craft for years to come. Others say that he was somehow drugged and hallucinated the incident. In another version of events the whole affair was scripted by the communist regime to direct public attention away from the economy, badly slumping at the time. The latter theory, although intriguing, lacks tangible evidence, apart maybe from the domino effect Wolski’s tale had on the mainstream TV, radio and press. Under the communist regime these weren’t, by today’s standards, independent and one could argue they repeated the story surprisingly eagerly, even if it was a magnet for audiences. But still the holy grail of conspiracy lovers, the involvement of secret services, has yet to find its way into this story. Rdułtowski's explanation is a hypothesis that the whole Emilcin thing stems from… a prank one ufologist tried to pull on another. 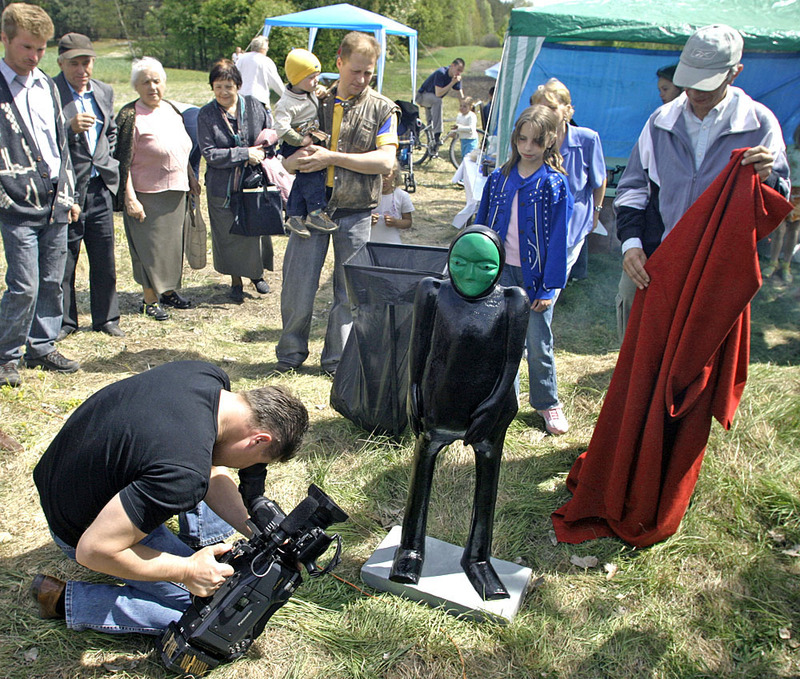 It is now time to introduce Witold Wawrzonek, a ufologist like Blania, but from Lublin. The author of Tajne Operacje PRL i UFO claims that about a month before the alleged Emilcin incident, the two gentlemen made a bet: Blania said he would have someone hypnotise Wawrzonek to remember things that never actually happened, while the latter claimed that wouldn’t be possible. Eventually, after a session during which the hypnotiser Lech Stefański managed to put Wawrzonek in a trance-like state, the Lublin ufologist woke up remembering some mumbo jumbo. Naturally, he didn’t feel all that happy about it and decided he wanted to get back at Blania. That is why Wawrzonek, a hypnosis practitioner himself, hypnotised the 71-year-old Wolski, planting the memory of the Emilcin incident in his brain. He simply wanted to trick Blania into believing a false story, the falseness of which Wawrzonek would reveal at the right moment, making a fool out of his antagonist. But after Wawrzonek informed Blania about the Emilcin incident, the latter worked so swiftly and efficiently on establishing it as a credible UFO encounter, that before Wawrzonek knew it, the fairy tale was already immune to any debunking among UFO believers. So it seems that Wawrzonek’s meticulous intrigue was gone, substituted by a myth about Emilcin aliens that just won't go away.